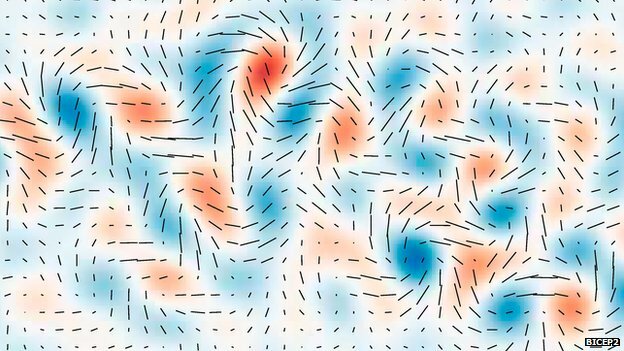 Cosmic inflation is one of the most fundamental and important theories in the sciences. It allows us to understand the early universe and why the cosmos appears the way that it does today. In essence, the theory is used to describe a period of rapid expansion that occurred shortly after the Big Bang (notably, it states that this expansion occurred at a speed that was much faster than the speed of light). The theory of inflation is necessary in order for scientists to be able to explain many things — the large-scale structure of the cosmos (i.e., why it is shaped the way it is and why matter is scattered in the patterns that we observe); why the universe appears homogenous across vast distances; and it explains, and is responsible for, the even distribution of the cosmic microwave background radiation (CMB). In other words, it allows us to explain and rationalize the Big Bang. And today (March 17th, 2014), astrophysicists announced that they may have found the signal left in the sky by this super-rapid expansion. The findings were made by the BICEP2 telescope at the South Pole utilizing data of the cosmic microwave background radiation (the faint glow left over from the Big Bang). Inflation depends on a specific prediction: That it would be associated with waves of gravitational energy. Ultimately, these tiny waves, or ripples in the fabric of space, would have left their mark on the CMB. And it’s these tiny waves that the scientists recently observed, tiny fluctuations in the CMB afterglow. Individuals in the astronomical community will continue to test and verify the BICEP2 findings in order to ensure their accuracy; however, the initial results are promising, as scientists have effectively ruled out most other potential causes.